CBNA students and staff embrace their holiday ugly sweaters at the recent CBNA Ugly Sweater Event. 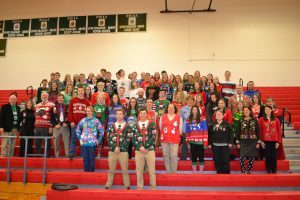 On Friday, December 9, students and staff at Coe-Brown Northwood Academy were recently caught spreading a bit of holiday cheer on the school’s annual “Ugly Holiday Sweater” day. Students competed for a chance to win gift cards to Dunkin Donuts by wearing their ugliest sweaters. Sweaters were judged by a panel of faculty members. This year’s winners were senior Joseph Guptill in the category of ugliest unaltered sweater and junior Courtney Snow for the ugliest altered sweater. This activity provides a chance for CBNA students and staff to get into the holiday spirit and spread some good cheer throughout the school community.